The US is planning to sue more than a dozen major banks for misrepresenting the quality of mortgages they sold during the housing bubble, the New York Times reports. The Federal Housing Finance Agency will argue that the banks should have known the securities were not sound. 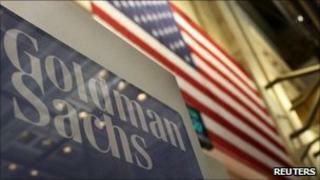 Bank of America, JPMorgan Chase, and Goldman Sachs are to face action, the newspaper quotes sources as saying. The suits could be filed as early as Friday, it adds. The Federal Housing Finance Agency - which oversees mortgage giants Fannie Mae and Freddie Mac - blames the banks for failing to perform adequate checks on the quality of mortgage securities they sold on to investors before the financial crisis in 2008. Fannie Mae and Freddie Mac lost more than $30bn (£18.5bn), partly because of the deals, and had to be bailed out by the government. The suits follow subpoenas the finance agency issued to banks last year, according to the newspaper. The BBC's Marcus George in Washington says this is the latest of a number of lawsuits against financial institutions who were involved in the practice of issuing mortgage-backed securities. However, some executives say the losses were made because of the wider economic downturn. Others fear further litigation against banks could damage America's fragile recovery, our correspondent adds.